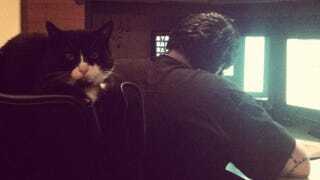 Binding of Isaac creator Edmund McMillen's cat Guppy recently passed away. He's understandably heartbroken. An item in Binding of Isaac: Rebirth, however, will ensure that Guppy's small furry legacy lives on. "Guppy was our only cat for 7 years, he was a very odd lil boy. he hated people, he was scared of the outdoors and had a habit of making direct eye contact and never looking away. he was extremely loving to us, a great majority of my games were made with him laying his head on my right arm while i drew with my left." "Guppy was Danielle and my mascot, we included him in almost everything we did and every video we made." "last week on the anniversary of the day we got him, guppy passed away. its hard to avoid the fact that such a significant part of our lives who was never intended to exists was with us for 12 years and left on the anniversary of the day we first saw him." "it's impossible to put into words how significant Guppy was to both of us, he was our 1st baby and we both loved him greatly.. 12 years feels like a short amount of time but im so grateful for the time i got to spend with him, our little ghost kitty." 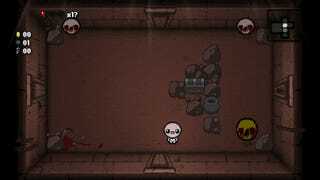 As is tradition, Guppy will appear in the nearly complete Binding of Isaac: Rebirth, kind of. There's an item in the dungeon crawler roguelike called Guppy's Collar, and it grants its wearer a 50 percent chance to come back to life (after dying) with half a heart in the previous room. The loss of a pet is an incredibly rough thing to go through (it's a cliche, but it really is like losing a family member), but Guppy's memory will—hopefully, in some small way—be kept alive by this and items in other Binding of Isaac games. I wish Edmund and Danielle all the best in their grief. I'll never forget the night I cradled my own cat as he slowly passed away—his eyes were so big—and my heart really goes out to them. Be well.